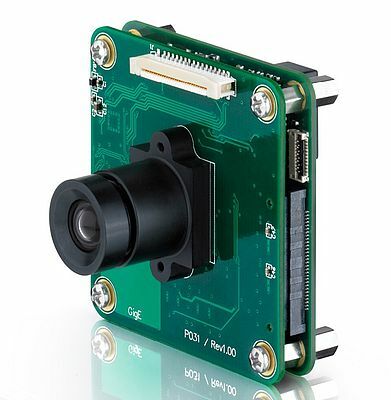 The Imaging Source's 5 megapixel board cameras with Power over Ethernet (PoE) are characterized by their compact PCB design (45 x 45 x 20 mm), Power over Ethernet (PoE) and highly affordable price. Binning, windowing and high-speed readout are but a few of the performance enhancements, which when coupled with DigitalClarity technology, dramatically reduce image noise levels. The color, monochrome and Bayer models ship with a resolution from VGA to 5 megapixel, a frame rate of up to 132 fps and integrate an M12 and C/CS mounts. As a result, the 5 megapixel board cameras are ideally suited to a variety of machine vision applications in the fields of automation, traffic surveillance, quality assurance, medicine and CCTV. The software support of the cameras leaves nothing to be desired: Both programmers and end-users immediately feel at home. Getting started with the cameras takes only a matter of minutes and integrating them into existing applications takes only a few lines of code. Drivers for LabView, HALCON, DirectX, Twain and WDM are included. All camera parameters and settings can be set via the shipped software. Furthermore, a number of automatic modes are available, which guarantee optimal image quality in varying light conditions. The cameras ship with drivers for Windows XP, Vista, 7 and 8, the SDK IC Imaging Control 3.2 (.NET and C++ class library) and IC Capture. The latter is a powerful end-user application, which allows all camera parameters to be set, live video to be displayed, singular images and image sequences to be captured.